In the south of Baja and mainland Mexico, summertime means tropical storms and hurricanes. In Mulegé, an unprecedented three floods occurred in four years, caused by rain-heavy hurricanes. People are claiming it is "global warming." But is it? After the 2005 record-breaking season of monsters like Katrina, Wilma, and Dennis, hurricanes became the poster child of climate change. An Inconvenient Truth&apos;s image of a hurricane spewing out of a smoke stack seems to say: we are fueling our own self-destruction. But I have to wonder, could my tailpipe emissions really create mega storms? If my home&apos;s electricity comes from a coal plants, does every time I turn on the light bulb -- or take a shower with water pumped from far away dams, or buy food transported from other countries by trucks and ships, and so on - mean I&apos;m contributing to the occasional destruction of a tropical island nation, or New Orleans, or Mulegé? According to my review of current scientific thinking, the short answer is ... probably, yes. But, we will never know for sure (and nuance in this field, as the story of Christopher Landsea demonstrated here, is not appreciated). It has been shown in multiple studies that greenhouse gases have increased the intensity of storms. Those claims are refuted by others who say data is inadequate. 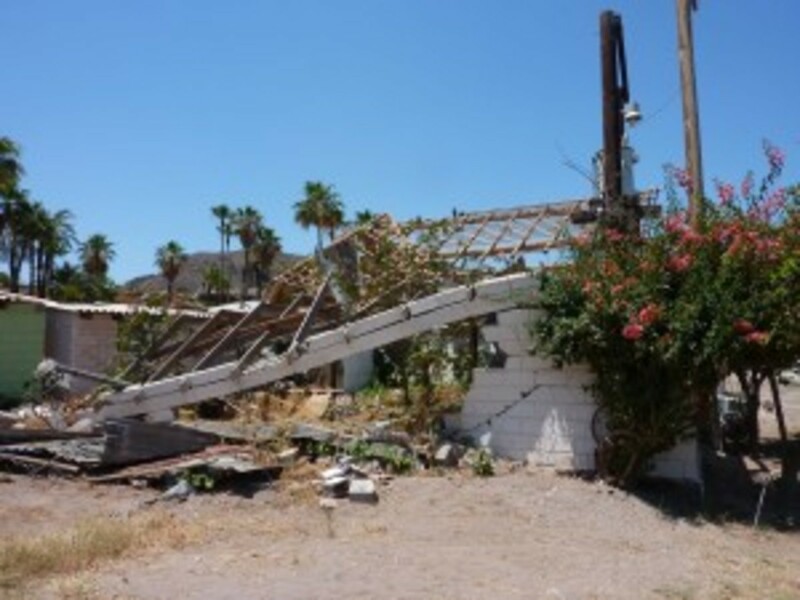 Hurricane damaged home in Mulege, Baja California. Meanwhile, everyone tends to agree that the frequency of storms is constant or even decreasing (number of days of hurricane activity). One of the common problems is that intensity and frequency are used interchangeably, particularly in popular media. The most important fact, which isn&apos;t really scientific at all, is that the destructiveness of hurricanes is related more to our building patterns than our emissions, which may be a source of hope for the future. The basic premise is that greenhouse gases increase the temperature of the atmosphere, and subsequently, sea surface temperatures through mixing. Warmer seas also generate more water vapor by the process of evaporation. Tropical storms are fueled by heat and water vapor, which in higher amounts (generally) creates stronger winds and more rain. With the right conditions, tropical storms can turn into hurricanes. In the last 15 years, scientists have vigorously researched whether and why hurricanes have become more powerful. Kerry Emanuel, an atmospheric scientist from Massachusetts Institute for Technology, has shownthat in the last 30 years the destructive potential of hurricanes has roughly doubled in both the North Atlantic and North Pacific, since storms are lasting longer and have greater wind speeds, in large part due to increased sea surface temperatures. Historical data from the European Centre for Medium- Range Weather Forecasts confirmed Emanuel&apos;s finding. Researchers at University of Virginia looking at historical wind speeds also determined that water temperatures of 83 degrees Fahrenheit might be a tipping point for major hurricane development (Category 3 or higher) and concluded that "rising sea surface temperature will act to increase the percentage of major hurricanes" -- although not necessarily the ultimate intensity of the storms, which is a result of other complex factors. Could natural variability be responsible for the warmer water and bigger storms, instead of greenhouse gases? There is speculation that during the last 20 years the increases in sea temperatures in the North Atlantic can be attributed to a phenomenon known as the Atlantic Multi-decadal Oscillation. Remembering that the North Atlantic only counts for about 11 percent of hurricanes around the world, researchers from the Georgia Institute of Technology surveyedall six hurricane regions in the world and found that although the total annual number of hurricanes hasn&apos;t changed significantly (i.e. frequency), the percentage of intense storms (Category 4 or 5) has increased - from 20 percent in the early 1970s to 35 percent in the 1990s. The global increase in hurricane intensity suggests it is not only an Atlantic phenomenon. A studyby the National Center for Atmospheric Research on the infamous hurricane season of 2005 showed that the Atlantic Multi-decadal Oscillation did play a role in that year&apos;s warm water, but it was only responsible for 10 percent of the increased temperature. Meanwhile, 25 percent was due to excess heat from the previous season&apos;s El Niño, 20 percent from natural year-to-year variation, and the remaining 45 percent was attributed to greenhouse gas-induced warming. The El Niño phenomenon, as suggested above, can play a role in the formation of North Atlantic hurricanes. The El Niño moves warm water in the Pacific Ocean from west to east, generating excess heat that can intensify the following season&apos;s hurricanes in the North Atlantic. However, the El Niño is also associated with high wind shear, which actually dismantles the convective energy of hurricanes in the Atlantic Ocean - low wind shear is one of the factors needed for the hurricane vortex to form. Hence, during El Niño years, North Atlantic hurricanes are expected to be less frequent. An equally dizzying array of studies is published that refutes the claims made above. Most hinge on a few key issues. First, pre-satellite hurricane wind speed data is unreliable because different monitoring techniques were used. Arcane discussions prevail, like whether "radio silence" in warships during World War II might have underestimated the intensity of storms. Second, the natural variability question (i.e. the Atlantic Multi-decadal Oscillation) isn&apos;t resolved which means there is "too much uncertainty" in drawing conclusions about the last two decades. Third, year-to-year observations (often in media of lesser credibility) say that since sea surface temperatures are cooler this year or this season&apos;s hurricane season is very slow, the hurricane/climate change connection should be dismissed. Clearly some of these refutations are more valid than others, but the popular media tends to pick them up as truisms. Articles are published with titles such as Climate myths: Hurricane Katrina was caused by global warming, from New Scientist, which does make some valid points; while Stormy Times for Global Warmists: Hurricanes, it turns out, are not caused by climate change, in Forbes magazine, is just hot air, no pun intended. Proving or disproving the connection is both equally difficult and blanket statements are misleading. The issue has become overly political, the science at its limits. Perhaps this is just as well, since the answer should come from society. After all, what do we really need? One of the specialists of the economic costs of hurricanes, Roger Pielke Jr., says the global warming and hurricane connection is "tenuous" at best. Even if it were the case, he reasons, the destruction caused by hurricanes is simply because more people are living by the coast. Population growth and wealth are 20 times more important than global warming, he says, in creating the conditions for catastrophe. If so, what is the best way to deal with hurricanes, by reducing carbon dioxide emissions or with better building codes in coastal areas? The best bets for reducing damage in the future may be with stronger buildings, restoring wetlands and dunes, and good flood management. The threat of bigger storms, whatever the reason, may be enough to persuade coastal communities to think before making development mistakes – and to restore protective ecosystems they didn’t value before. Beyond the human carnage of Mexico's drug conflict, another innocent bystander — the environment — has long been a victim.